Circular, dsDNA genome of 228-232 kb. Encode for 113 predicted open reading frames. 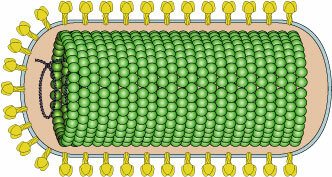 Virus attaches to host receptors, and is internalized by pinocytosis. ETYMOLOGY Nudi: from Latin, “naked”, related to the assumption that this virus group represent non-occluded baculovirus.